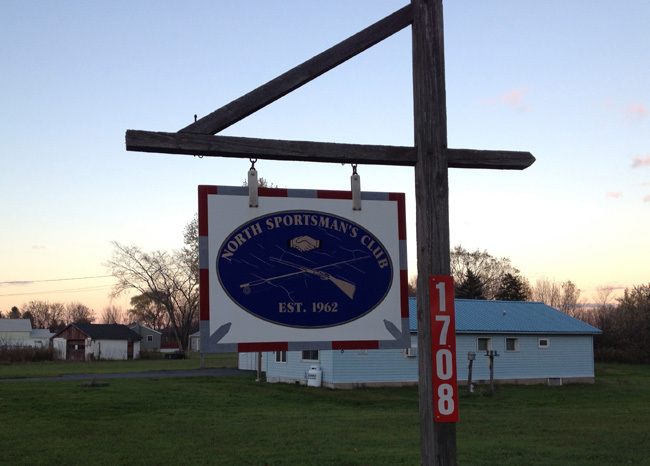 The front gate of the North Sportsman’s Club in West Monroe, NY. 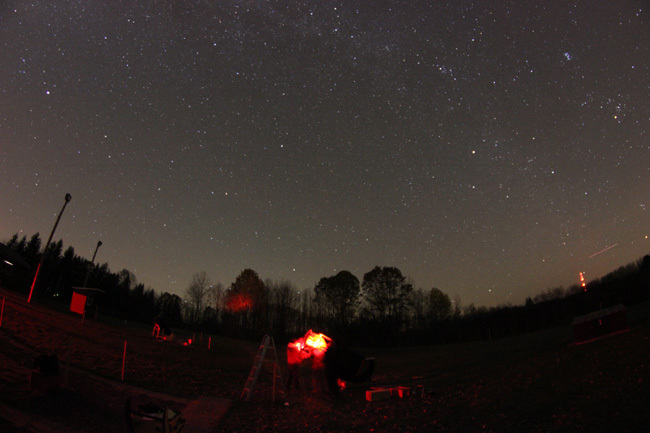 The first CNY public outing of New Moon Telescope’s (NMT’s) massive 27″ Dobsonian took place this past Sunday, November 3rd at the North Sportsman’s Club in West Monroe, NY. After two overcast evenings (despite Friday the 1st looking quite reasonable all afternoon) and a cloudy Sunday morning that ruined local views of the hybrid solar eclipse (see our post of the event HERE), the weather settled Sunday afternoon for what became a very cold-but-clear evening of observing at what turned out to be a quite dark location (despite its close proximity to Syracuse and its well-lit surroundings). All research indicates that NMT’s flagship 27″ Dobsonian is the largest portable telescope in New York, and it is fair to say that it is in the far end of the Gaussian size distribution of all amateur scopes in the U.S. Those who have been to any CNYO event have been treated to at least one of Ryan Goodson’s fine Dobsonian creations, as Ryan, Larry, Dan, and myself all own (at least) one. The 27″ Dob features a few notable additions to NMT’s add-on packages, including full GOTO functionality by way of Servocat and Argo Navis. We are pleased to report that this is definitely not a one-view deal! When NMT or CNYO schedule an event that will feature the 27″ Dob, we will be sure to make note of it (the timing and the temperature were less than ideal for many of the people who responded to our announcement on the TACNY listserve, so we hope to bring that many more people out to future sessions). And if you want to keep up-to-date on all things NMT, I urge you to like their Facebook Page and subscribe to their twitter feed. 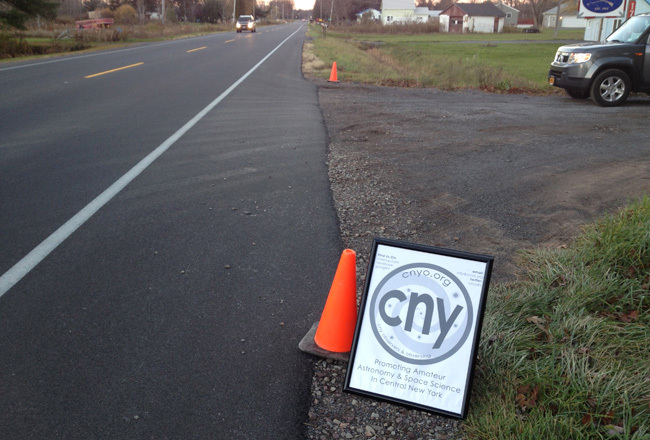 The CNYO sign at the NSC front gate (81 to 49 to 37. An easy find!). 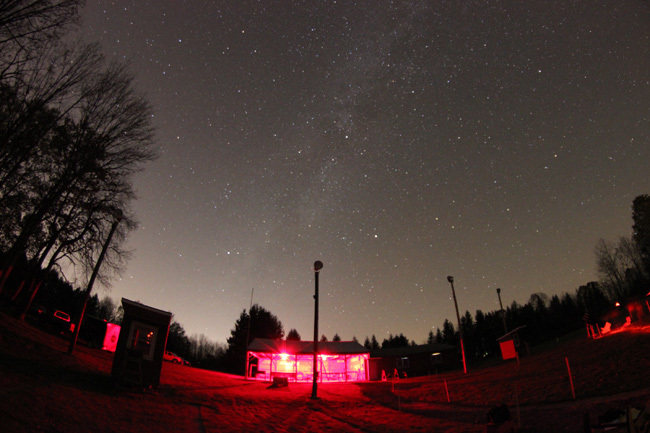 We were fortunate to make the acquaintance of North Sportsman’s Club’s (NSC’s) John Knittel at both CNYO’s Beaver Lake Observing Session on May 2nd and NMT’s Perseid Meteor Shower Session this past August. NMT jumped at the chance to have the First CNY Light for the 27″ Dob at the NSC and CNYO members were delighted to help promote and support the event. The NSC is an ideal location for public observing, combining a large, clear range with all the amenities of home (in this case, restrooms for both genders, a heated meeting room, and coffee and cocoa on tap thanks to a few NSC members who braved the outdoors indoors and kept the conversations going). All that aside, the view from the Northeast to the Southeast is as clear as it gets right down to the low tree-lined horizon (a pleasant change of pace considering the zenith-centric views from several other locations we’ve observed from), giving observers a chance to catch first light of rising objects and many hours to track those same objects as they rise towards the zenith and fall to the still reasonable western sky. 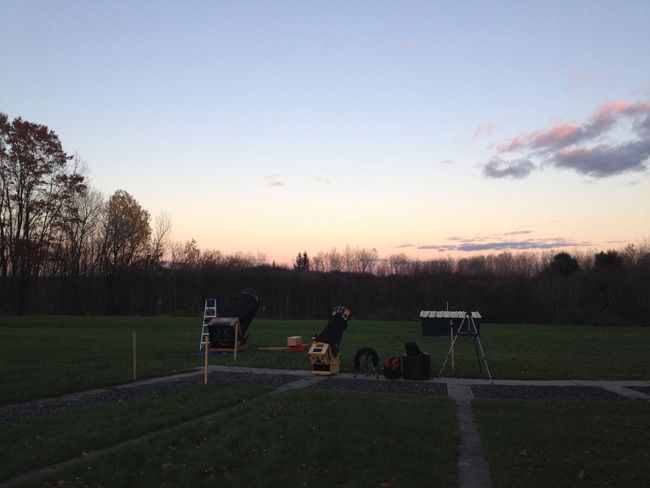 The NSC range and the view to the East (with the 27″ and 12.5″ Dobs). Click for a larger view. 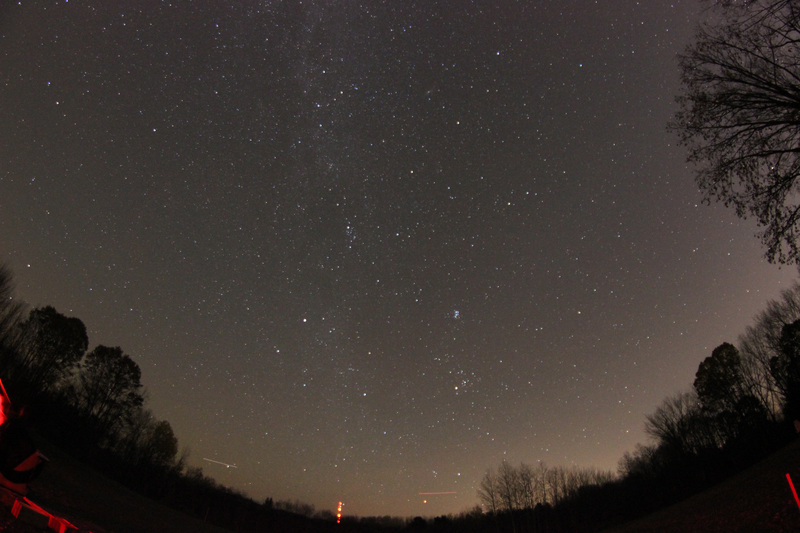 The same view to the East, featuring two planes, the Milky Way, and one radio tower. Click for a larger view. Despite the “school night” timing and the very-to-bitterly cold weather, approximately 30 people made it out to take in the views through the 27″ Dob, my 12.5″ NMT Dob Ruby, and Steve Capp’s 16″ NMT Dob. To the usual suspects – Larry Slosberg, Ryan and Heather Goodson, Dan Williams, and myself – local amateur astronomers Joe Chovan and David Wormuth also braved the cold to enjoy the sights. The long-distance awards go to our good friends in the Kopernik Astronomical Society – Fibber and Sally Magee, as well as Art Tilts, who arrived early and hung out late. The timing of the proper observing attire article in December 2013’s Sky & Telescope did not go unnoticed on our Facebook Group Discussion of the event. You don’t really appreciate how cold the outdoors can be – and how quickly the heat can leave you – until you’re standing still for long periods of time peering through an eyepiece. The physics is simple – when the temperature outdoors drops below the temperature of your skin, YOU become the heat source for the outdoors. I suspect Ryan and I both learned (the frozen-solid way) from last February’s Baltimore Woods Session. The solution to freezing is simple – just do what the article says and and be “Dressed for Stargazing Success.” In anticipation of the first real cold night of observing since last March, I made the pilgrimage to DeJulio’s on Burnet Avenue, walking out with dual-layer long johns, wind-proof (and pocketed) pants, a stretch face/head cover, a brim-less hat (funny thing about the brims – they keep your eye from the eyepiece), and a few extra pairs of wool socks. Was it cold out? Yes. Did I care? Not a bit. Ryan, Larry, Art, and Joe packing up the 27″, with Steve Capp still observing through his 16″ in the back. Click for a larger view. Ryan and I were set up by 4:00 p.m. and observed with attitude until about 9:00 p.m. when the rest of the crowd had made the short trip back to Interstate 81 (having a location this good only 20 minutes from downtown was a real treat for those of us used to debating the unloading of the car that night). The North Sportsman’s Club at night, complete with the other half of the Milky Way. Click for a larger view. CNYO gratefully acknowledges John Knittel and the members of the North Sportsman’s Club who not only made the event possible, but kept the festivities going inside to boot. We hope to do it again!